It was a mystery that left scientists around the world buzzing for answers. Last year a mysterious and deadly plague silently worked its way through bee colonies, leaving millions of dead bees in its wake. The killer was coined as CCD or Colony Collapse Disorder. It had moved in suddenly and unexpectedly, and left so few clues, experts could not crack the case. Luckily this past September, there was a big break in the case. A team of scientists led by the U.S. Department of Agriculture (USDA), Pennsylvania State University, The Pennsylvanis State Department of Agriculture and Columbia University linked CCD with a virus imported from Australia, IAPV or Israeli Acute Paralysis Virus. Over the past three years, genetic tests on bees collected from stricken colonies around the U.S. found the virus in 96 percent of bees from hives affected by Colony Collapse Disorder. Researchers at Penn State University and the USDA are planning a complicated set of experiments where they stress bees in certain ways and evaluate the effect on their health. The tests will hopefully indicate whether IAPV causes CCD by itself or if it is triggered by other pathogens and stresses. Some studies on IAPV have already brought positive news. Israeli researchers say there is a possibility that IAPV-resistant bees can be bred. A third of bees sampled in Israel have incorporated the virus into their genome. 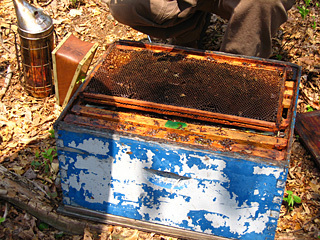 In experiments, almost 20% of these bees survived when injected with IAPV. While the work is ongoing and answers are sought, until the government declares otherwise, the nation’s borders remain open for bees. Packaged bees are being brought in from Australia, which has yet to report cases of CCD colonies. Though researchers are still searching for answers, they are considering whether stressors that disproportionately affect U.S. bees such as pesticides, poor nutrition or pests like varroa mites might trigger the virus, making it virulent. Last year, imports from Australia and New Zealand made up only 5 percent of the bees needed just for almond pollination (though almond pollination represents half of our need for honeybee pollination services).